to Full Circle Health Network? We are conveniently located in the beautiful historic Woolen Mill in Downtown Kingston at 4 Cataraqui Street, Suite 110. We have ample free parking surrounding the entire building! 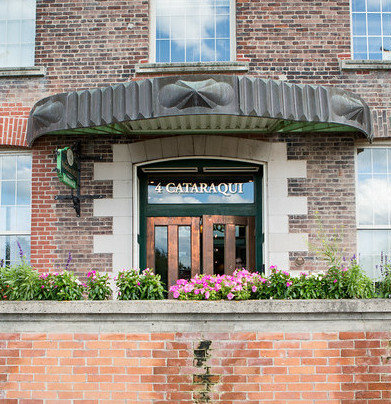 Please use the copper doors on the main Cataraqui Street entrance on the North side of the building (before the River Mill Restaurant). We are the first Suite on the left, through the double doors. Please remove your shoes and make yourself comfortable. If you have not completed the online intake form please arrive ten minutes prior to your appointment. We have water and hot tea waiting for you! At the beginning of your appointment there will be an initial assessment and discussion with your practitioner to get to know you and what brings you in today. If you are arriving after 5:30pm on weekdays or any time during the weekend, please use buzz code 110, as the doors will be locked. To exit the building after 5:30pm the doors will be locked, but not to worry! Simple press the green exit button followed by the accessibility button, to the left of the door and away you go. For all inquiries please email us at info@fchn.ca or call us at (613) 766-3503. Want to work on our team? Are you looking for autonomy in your practice? Do you want to offer your clients a more holistic environment with better collaborative care options? Do you want to work in a fun environment where you are challenged and supported? Full Circle Health Network is expanding, and we are looking for like-minded holistic practitioners to join our circle of enthusiastic professionals. For more information or to submit a resume, please email us at info@fchn.ca. Geneviève is continually amazed by the body’s natural ability to heal itself. It’s that sense of excitement that has driven her long and varied career in natural healthcare – and that still drives her in her work as a Manual Osteopathic Practitioner and Clinic Owner at Full Circle Health Network. She loves being able to think through anatomy and come up with treatments that really “fit” her clients and she is happiest when she has empowered clients to take charge of their own health. Geneviève opened the original Full Circle Health Network in 2010, which then offered Registered Massage Therapy and later, Classical Osteopathy. In 2014, Full Circle Health Network expanded and opened up in the beautiful Woolen Mill building into a much larger and more elegant space – it was the best move she ever could have made! Since then, Full Circle Health Network has continued to expand its services, attracting some of the best practitioners in Kingston working in the field of complementary healthcare. Geneviève holds a Masters in Osteopathic Manipulative Sciences and an Honours Bachelor of Science in Health Studies and Gerontology from the University of Waterloo. She has a 2200-hour Massage Therapy Diploma from the Canadian College of Massage and Hydrotherapy, where she pursued additional training in pre- and post-natal massage care, including high-risk pregnancy care. Clinical experience includes work at the Women’s College Hospital in Toronto, ON, where she provided massage in the antenatal and postpartum units. She has taught Clinical Massage Therapy at Trillium College, and previously worked as a fitness instructor specialist (Can-Fit-Pro), “Varsity” Athletic Trainer, and Ergonomic Contractor and Health & Safety Specialist. After seeking holistic approaches to her own infertility, Krystle began to feel destined to change career paths and find a way to help people take control of their own health. With a background in communication, customer service and having 15 years of management experience, being able to create the best experience on your wellness journey at FCHN is her number one goal! When she’s not spending quality time with her daughter and husband, you can find her reading, crafting or crocheting. She is originally from North Bay, Ontario and has lived in many places throughout Canada. She has been in the Kingston area since 2011. Book an appointment with Lesley! Lesley truly believes in the importance of having a high quality of life and loves seeing her clients be able to realize that quality through occupational therapy! Over the past 13 years Lesley has worked collaboratively with each and every one of her clients helping them find the tools and resources they need to achieve their goals all the while fostering a warm, empathetic, and supportive environment. Her training, experience, and passion lies in providing treatment to clients suffering from concussions, depression, anxiety, cognitive impairment, chronic pain, chronic illness or injury; as well as those clients adjusting to a significant life change. Lesley approaches her practice using a client-centred holistic approach to care. Each treatment plan is individualized based on her clients’ needs and is focused on empowering her clients to overcome their physical, cognitive, motivational, or emotional barriers with practical solutions. Prior to her career as an Occupational Therapist, Lesley was a competitive swimmer at Penn State University where she obtained her undergraduate degree in Kinesiology. She establishes a balanced approach to life by engaging in an active lifestyle outside of work and prioritizing quality time with her family and friends. Lesley is a Registered Occupational Therapist in good standing with the College of Occupational Therapists of Ontario (COTO). She obtained her Master’s of Science in Occupational Therapy from the University of Toronto (2003). Sandy has been teaching Mindfulness Based Stress Reduction since 2013 and has been practising meditation most of her life. She began with a career in the financial sector. She later spent many years volunteering and working as a lactation support in the community as well as in Kingston area schools facilitating Mindfulness in Education, Meditation, and Hatha Yoga. She also enjoyed working with elementary children supporting the Grow Garden Project. She has been a passionate fundraiser who is vested in community initiatives. To deepen her practice and gain a thorough understanding of the philosophies at the heart of her practices, she completed teacher training in Sivananda yoga with Swami Nitya Muktananda and Hatha yoga with Deborah Koehn. Sandy’s initial training in Mindfulness-Based Stress Reduction took place in 2013 at the Omega Institute in Rhinebeck, New York. Sandy’s training also includes basic and intermediate courses in Jin Shin Mind-Body Acupressure, and several Mindfulness-Based Stress Reduction courses with founders Jon Kabat-Zinn and Saki Santorelli, and others. Sandy is a qualified teacher through the Center For Mindfulness at the University of Massachusetts. She has trained privately in Kingston, Toronto, New York City, San Francisco, Fort Lauderdale, Hawaii, Mexico, Ireland and Switzerland. Full Circle Health Network is thrilled to have Sandy as part of it’s team, where she instructs and facilitates Mindfulness-Based Stress Reduction Programs in a group setting inside the FCHN Studio and now on an individual basis. Adrienne comes to the clinic with a passion for health care and well-being. Adrienne holds a Bachelor’s degree in Health Studies from Queen’s University, with a focus on the physical and social determinants of health. She then received her 2200-hour Massage Therapy Diploma from Canadian College of Massage and Hydrotherapy, with a hospital specialization. She is a member in good standing with the College of Massage Therapists of Ontario, as well as the Registered Massage Therapists’ Association of Ontario. Adrienne focuses her practice on getting to the ‘why’ of dysfunction. She has a strong interested in fascial pain and compensatory chains in the body. One should expect to leave their treatment with homework exercises to make lasting changes! Adrienne has a varied practice which includes perinatal massage, as well as treating acute, chronic, and myofascial pain conditions. She offers Cupping Therapy to decrease fascial adhesions and pain. Adrienne has experience in the high risk pregnancy unit at Sunnybrook Hospital in Toronto, ON. Her clinical placements with the University Health Network in Toronto, ON allowed her to bring relief to those in a variety of hospital settings. For community outreach, she has worked at Jessie’s House, a shelter for young pregnant mothers, Mount Sinai hospital, as well as various events within her community. When Adrienne is not in the clinic, she can usually be found out at the barn riding her horses, hiking with her dogs, eating sushi or enjoying a good book. Kate believes people start to heal the moment they begin to feel heard, and welcomes you to share your concerns in a comfortable, non-judgemental space. She knows it’s a privilege to be able to bear witness to someone’s story when they may not have had the chance to tell it before. Providing encouragement and walking alongside you during your journey of personal growth, counselling can provide an outlet to explore complex emotions with gentle guidance. Kate recently graduated with a Master’s degree in Social Work from McGill University with a specialization in health and social care, and holds a Bachelor of Arts degree in Psychology from the University of New Brunswick. Passionate about helping clients create and achieve their goals, Kate works from a solution focused perspective, integrating aspects of cognitive and behavioural evidence based practices to create personalized care plans. She has specialized in person-centered practices to care, and understands the role individualized care plays in the healing process. Since recently relocating from New Brunswick with her rescue cat, Sasha, Kate looks forward to helping others reach their full potential in her new community. There is something that lives within each soul that demands to get out, to be realized, to be fulfilled. For Andrea, that is working with individuals on their path towards healing. Each person and their path are unique. One commonality amongst all, is that each person has an innate capacity to self-heal. Andrea feels that addressing all components of the individual; the physical, mental, emotional and spiritual, is necessary to bring the individual back to their natural state of being, and back home to their holistic self. Since childhood, Andrea has felt compelled to work in a helping capacity, bringing her into Social Services in her late twenties. Andrea worked as an Employment Advisor at KEYS Job Centre, which often entailed guiding people on their journey through the very challenging and emotional rollercoaster ride associated with unemployment. After 16 years, Andrea knew that she was being called to something different, and it was then that she moved out of employment and into holistic wellness. Andrea has been teaching yoga and meditation since 2009, however she was able to embrace these teachings in a more full-time capacity in late 2016. In addition to yoga and meditation, Andrea began her training as a Reiki Practitioner in 2008, completing her Karuna Reiki Master training in 2010. Andrea has often used Reiki in her classes, as well as on family and friends, and now in her private practice at Full Circle Health Network. Andrea feels very honoured to share this ancient healing art with others, to help facilitate an environment where people can access their own capacity to heal. Andrea is also driven, due to the loss of her mother to Ovarian Cancer in 2013, to work with individuals who are facing a cancer diagnosis. She attained specialized training in Yoga to work with this population, and now teaches classes at KGH, as well as through her company, Into The Flow Yoga and Wellness, at Full Circle Health Network. Victoria Mokriy has been practicing physiotherapy since 2009. She is passionate about restoring previous function and quality of life. After completing her Master’s of Physical Therapy at Queen’s University, Victoria practiced in Ottawa in several sports medicine clinics. Her initial practice focused on orthopedics/manual therapy, acupuncture/dry needling and post-concussion management. Beginning practice in Kingston in 2014, her treatment expanded to include vertigo and dizziness rehabilitation, temperomandibular (TMJ or jaw) dysfunction, and functional movement assessments/treatment. Victoria’s approach to client care is to conduct a thorough assessment that allows for treatment plans individualized to the patient’s needs. She believes that with the correct tools and direction, the human body is able to achieve wonderful things! Her goal is to ensure that you regain as close to normal function as possible. She has found in the past that her clients are most successful when a consistent plan of care is created by herself and the client. Victoria knows that physiotherapy works, if you’re willing to work at it! Victoria holds an undergraduate degree from the University of Ottawa, and a Master’s in Physical Therapy from Queen’s University, and has maintained a practicing licence with the College of Physiotherapists of Ontario. She spends her free time with her family, including her husband and young daughter. She also enjoys running, strength training and playing soccer. Amanda views the human body as a perfect creation, self-healing, self-aligning, and self-regulating. As a student of the Canadian Academy of Osteopathy, Amanda feels that the wealth of knowledge gained is best put to use to help her clients achieve their overall health goals, through an intuitive and tailored approach. Amanda’s studies began in 2014 at the leading school of Classical Osteopathy, and continue today. Her fresh personality, and calm demeanor, is the cornerstone of her approach to her clients overall wellness. Amanda credits her passion for learning, and helping others, to her love of horses and her rescue dog, Forrest. Her intuitive approach to Osteopathy is akin to the silent relationship and trust built with her animals. Through years of challenging herself to understand and react to her perception, Amanda has honed her skills and continues to do so as a part of the Full Circle Heath Team. Kelly has been working in physical rehabilitation for over twelve years. She graduated with a Bachelor of Science in Kinesiology from the University of Waterloo in 2005. She started her career as a Kinesiologist and Exercise Therapist at a Multidisciplinary Physiotherapy Clinic, giving her extensive patient care experience with a vast patient population, including acute and chronic injuries, work conditioning, vestibular, chronic pain and cancer patients, motor vehicle accident and work place injuries. When she is not treating patients, you can find Kelly on a volleyball court, walking her dog Ruby or enjoying the outdoors. Book your appointment with Kristin! Since 2012, Kristin has worked in various counselling settings in government and community agencies in British Columbia and Ontario using both art therapy and/or clinical counselling to address a variety of mental health issues. Kristin’s work is diverse and includes one to one therapy for children, youth and adults, couples counselling and family counselling. As well as creating art therapy based workshops for the community. Kristin practices a strengths based model for change in a collaborative treatment focused modality. Kristin obtained a double major Hons. BA in Psychology, Neuroscience & Behaviour and Fine Art from McMaster University in Hamilton, Ontario. Continuing her education at Kutenai Art Therapy Institute in Nelson, BC, Kristin completed her Master’s level degree in Art Therapy before graduating from a Master’s degree in Counselling Psychology from Yorkville University. She is also a registered psychotherapist with the College of Registered Psychotherapists of Ontario. Laura is a University of Waterloo graduate currently attending the Canadian Academy of Osteopathy, in her third year. She discovered osteopathy during her undergrad studies and never looked back. She knew immediately this was how she wanted to help people, through an integrative natural approach to healthcare. Laura was excited by the way the body was able to heal itself and the only apparatus she needed were her hands. Laura is enthusiastic to be able to use the body’s anatomy and physiology to create individualized treatments based on what her patients need. She wants to share with people just how amazing their body can be. Laura believes her relationship with her horse has given her a patient, quiet and intuitive approach to osteopathy and will continue to use this approach while working as part of the Full Circle Health Network team. Catherine is new to Kingston. She recently relocated from Montreal, where she enjoyed working with physicians and patients at St. Mary’s Hospital, as well as students and faculty at Concordia University. Catherine holds a Bachelor of Fine Arts degree in Art History from Concordia University and a Masters in Library and Information Studies from McGill University. In her spare time, she enjoys travelling, practicing yoga and meditation, reading and going for walks with her husband and dog, O’Malley. Our Rehabilitative Manual Therapists are upper year students enrolled in a 4+ year Osteopathic program. Please note receipts will indicate Rehabilitative Manual Therapy and may or may not be accepted by an insurance provider under “osteopathic services”. Can’t decide which is best? Read more about each of our counsellors! Kristin Dillenbeck – Registered Psychotherapist & Art Therapist **Sliding Scale slots available. Pregnancy Massage available as well! HST is included in all prices. At Full Circle Health Network, when you see a price for services, that is exactly what you will pay. Where applicable, HST is included (unless otherwise stated). We accept cash, cheque, debit, Visa, Mastercard and American Express. Many of our services are covered by extended benefits plans; receipts are provided for all services. For more details, please check with your insurance provider. Please arrive 5-10 minutes early for your initial appointment. To respect your practitioner’s time, as well as the time of other clients, if you arrive late to your appointment, your session will still finish at its scheduled time. Because Massage Therapy falls under the Regulated Health Care Practitioner’s Act of Ontario, it is considered a health care service in Ontario. For this reason, many people who have extended health care coverage are able to have a portion or even ALL of the cost of their massage therapy treatment covered by insurance. Some plans, however, may require that you have a doctor’s note before any claims can be submitted, so please check with your provider to see what your coverage entails: every plan is different. Even if you do not have massage therapy covered under your benefits, you may be able to claim RMT expenses on your taxes, since it is recognized as a health care expense. The Woolen Mill has FREE parking surrounding the entire building. There are several bike racks just left of the East Wing doors. Once through these doors continue until the end of the hall, we are the last suite on the right. Unfortunately as the Woolen Mill is a historic building we do not have much signage out front. Is the clinic accessible via the bus? Yes, however the nearest bus stops are a 10 minute walk from the Woolen mill. Taking Bus Route #1 is close. We do not handle direct billing, however, we can email or print your detailed invoice for ease. You can book online via our website, or you can give us a call! We’d love to speak with you! Are there walking trails along Lake Ontario? There is a newly renovation accessible walking and bike pathway that run along the lake and directly in behind the building. What was the Woolen Mills original use? The Woolen Mill is a 19th-century building, and such structures were built to last. This four-storey red brick building was constructed in 1882 when a group of Kingston businessmen needed a place in which they could produce cloth. We’re proud of the expertise that flows through our practice and the sincere compassion that underpins our team. Our space radiates warmth because we believe that people matter – you matter, our therapists matter, our community matters. We do our best to make feeling great simple and easy, from our grounded sensibility right down to our online booking option, extended hours, and ample free parking. Great team of professionals!!! Love the atmosphere and how special they make me feel. The best massage place ever. I will not replace it for any other place. Service is highly professional, most relaxing and extra clean. Highly recommend. 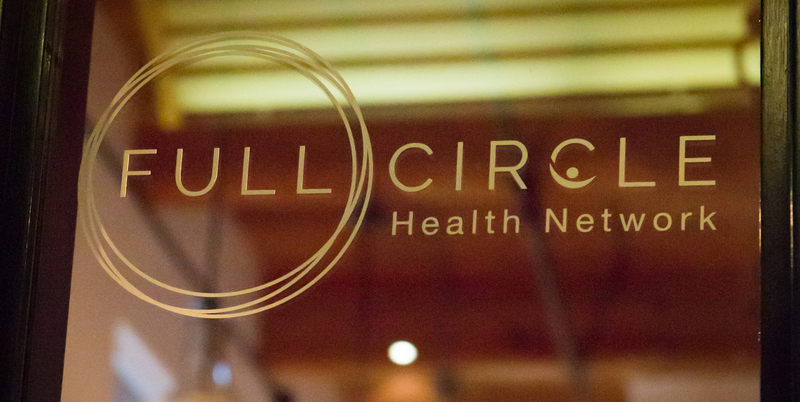 I have only great things to say about Full Circle Health Network…. they have helped me with my healing process like nobody else… I recommend them to anyone and everyone! ALL PATHS LEAD TO YOU!